Note: Initial stuff is basic one so you can skip this if you are already knowledgeable about what affiliate marketing actually is. An Affiliate marketing is basically an agreement or arrangement between An Affiliate Marketer and retailer who pays commissions to him/her as a result of making sales by marketing its products & services. In simple words, let’s say you have a blog or website, you can simply become an affiliate marketer of a company/retailer, sell its products or services and make commissions. It is a kind of performance based marketing, the more sales you make, more earnings you will have, it is that simple. Note: To keep it simple for newbies, in above definition, I have mentioned “Earning Money by making sales” This is very generic type of term used for making money with affiliate programs but in actual many affiliate programs also pay you money by deriving visitors who complete other specific steps as well like download their software, Install apps, submit forms (pay per lead), pay per call etc. But since this is not a scope of this article so we are just defining the affiliate term in its simplest form. An affiliate marketer is a person who signup as an affiliate member of a retailer/company and sells its products or services for making profits. Joining as an affiliate marketer doesn’t cost you anything…Most of the companies offer free affiliate partnerships, So you can just join them free of cost and start promoting their products/services. You don’t need to go anywhere to start your affiliate business, you can simply start working from home in your pajamas. No need to work on any predefined time schedule. You can work whenever you want and from wherever you are. : There is nothing to lose to start your Affiliate Marketing business. There is no need for any physical locality such as office, warehouse, shop etc and no need to take any stock or storage. You can make money selling the affiliate products to anywhere as a lot of companies provide worldwide services particularly in case of selling digital products. Affiliate Marketing is not a Get Rich Quick thing. It takes time to build your online affiliate marketing business and start making really good amount of income. Following are some of the best people in Affiliate Marketing Industry you can take as role model and learn from them. 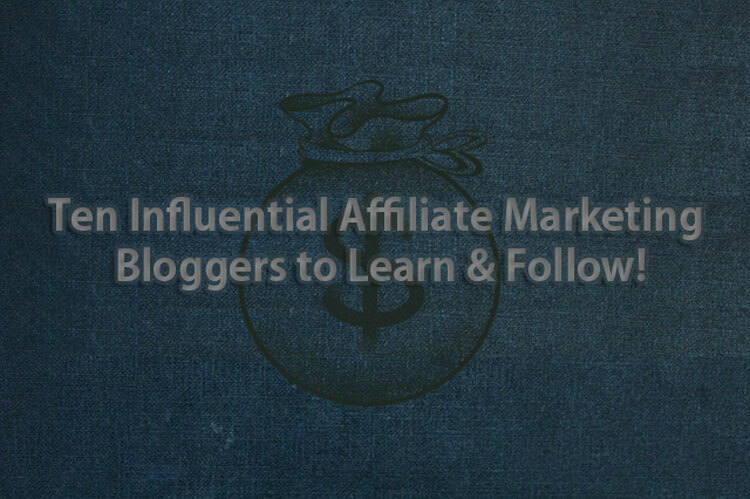 Note: The following Affiliate Marketers & blogs are not mentioned in any specific order. Please don’t get offended or feel upset if your favorite blog is not included in the list as I could only list few ones. Pat Flynn is one of the best in the industry who knows his stuff. He came into an affiliate marketing industry in his early age and is now able to make huge monthly passive income from his blog which is called Smart Passive Income Blog. He also publish his monthly Affiliate Income reports which can be a great motivation. Learn More about Pat Flynn Here. Owner of AffiloRama, Mark Ling is a well-known Internet Marketing Guru who teaches about how to make money online as an affiliate marketer. His site AffiloRama is one of the largest affiliate marketing community and training based website on the internet to help you learn and discover the freedom of making money online. Zac Johnson in running ZacJohnson.com, An Internet Marketing blog for more than 15 years. He is an exceptionally successfully blogger and affiliate marketer who knows how to get into an Affiliate Marketing thing and get most out of it by using the best internet marketing techniques. Quit your day job & become your own boss by starting your online affiliate marketing blog. Create an authority website & establish your online brand. Spencer Haws runs a website named NichePersuits.com, which is geared mainly towards creating niche affiliate sites & buying/selling websites for profits. He is a great person to learn about how to create Amazon Affiliate Niche sites & building an Amazon FBA Business. He is also a founder of LongTail Pro, a top class keyword research tool to help you getting rank on long tail keywords. Matthew Woodward is an award winning business & internet marketing blogger, international speaker and an inspirational affiliate marketer. His site MatthewWoodWard.Co.Uk is one stop place for learning different aspects about how to earn an income online from Affiliate Marketing and through different other means. There are so many other Affiliate Marketing Blogs/sites that can give you all the knowledge in order to become first class Affiliate Marketer. Make goals & try to achieve those goals. In order to become successful with Affiliate Marketing, you need consistent efforts. If you read About Us pages of the above mentioned bloggers, you will notice it took most of them some time before they were able to make some real good & consistent income from affiliate programs. So, keep yourself focused towards achieving your goals in order to accomplish the level of success & lifestyle you always dreamed of. If you want to learn more about Affiliate Marketing & How to build your Affiliate Marketing Business….Check Out My Affiliate Business Resources Section.